If you're still skeptical that student data privacy issues are of the utmost importance in school communities, check out the latest information about the massive data breach from a prominent edtech company. Implementation of a vetting process for new apps or programs in school districts is essential to protect students' personally identifiable information (PII) and aggregated data. (If you're looking for information on setting up your own vetting policy, download this toolkit from CoSN and check out some resources from Cambridge Public Schools.) The alphabet soup of regulations – like FERPA and COPPA – can be dizzying, but they need attention. But once your vetting process is in place, it isn't time to relax just yet. Rather, schools and districts should push themselves even further. As a teacher, I sometimes found it frustrating when I had to wait to get access to the digital tools I wanted my students to be able to use. (If I had decided that a video creation tool was great, I wanted my students to be able to try it out right away!) Now, as a digital learning specialist, I want to make sure the teachers I work with feel as little frustration as possible and develop an understanding of why short delays are sometimes inevitable. Based on my experiences as a classroom teacher and a digital instructional coach, I have some recommendations for the steps schools should take. Start by informing classroom teachers about the vetting process within normal conversations in regular team or department meetings. Make sure it is clear that teachers are not responsible for vetting on their own, but that the information is being shared with them so they can be more informed educators and users of digital tools. To help calm any anxieties, emphasize that the research, investigation, and communication with companies will be handled by district technology and administrative professionals. After allowing a few months – either a summer break or a quarter grading period – for the new policy to settle in and become part of the routine, it is time to share more sophisticated information about data privacy and digital citizenship with teachers. Here's why: It is no longer uncommon practice for educators to share information about their profession, school, or even students online. It may be shared in a professional blog post, as part of an education-focused Twitter chat, or just as a funny anecdote on their personal social media account. 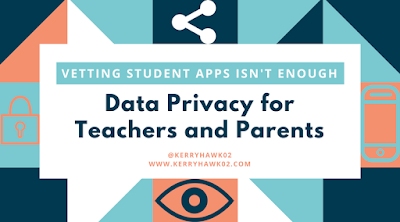 Teachers need to understand that their personal and professional online identities are not separate because of the way their data trail connects everything they do. No teacher should be told not to use digital tools or social media. Their positive modeling for the students and parents in your community is invaluable. In addition to the Educator's Guide to Student Data Privacy mentioned above, resources like the Educator's Guide to Social Media, a free guide from Larry Magid and I, and BrandED, a new book from Eric Sheninger and Trish Rubin, are excellent resources to help you plan those formal professional learning sessions with your teachers. This video or this video from Common Sense Education might be a great way to kick off your session. Of course, this should be part of a thorough digital citizenship school-wide program. Data privacy is an essential part of helping our learners understand how their behavior online can have an impact on their in-person lives. As part of that digital citizenship school-wide program, parent programming should be prioritized. At my school we provide webinars that are both live and recorded, parent council presentations, and interactive experiences specifically for grandparents, incoming parents, and more. While some offerings are compulsory and others are optional, there is no way to offer too much parent education around digital health and safety in schools and at home. In my experience, parents are hungry for help when it comes to managing their children's screen time, online interactions, and developing a healthy balance of technology use. In fact, we are constantly looking for new ways to reach more parents and are hoping to offer even more programming next year. Some of my favorite resources for parents include ConnectSafely's library of Parent Guides and Janell Burley Hoffman's iRules. Now, in you district, the order of these steps might be different based on the interests and involvement of your stakeholders. This post is not meant to be a decisive solution. It presents options and ideas to provide guidance for schools that are in the midst of the process.